You can earn 33 AYP PUNK ROCK POINTS on this product! Get ready for some beach blanket bingo when you are wearing the NEW Rogues full coverage halter suit from Banned. 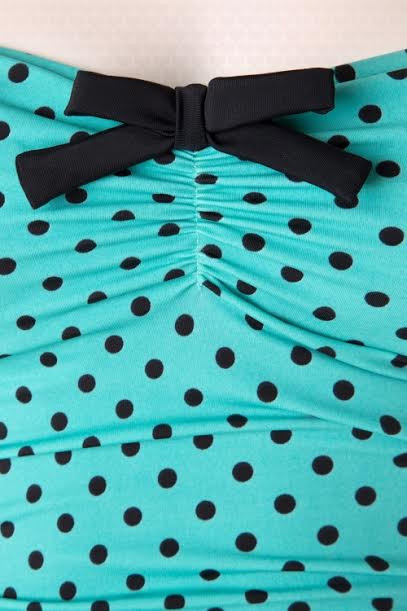 This suit features a halter top with a pleated sweetheart neckline, two fixed adjustable black halter straps which should be tied in the neck, molded cups, and a cute fixed black bow. The ruching side seams and skirted typical fifties front are very flattering. The suit can be worn long or pulled up to show off more skin daddy-o! The black lining features a special "tummy area” to mask any tummy flaws, sewn soft cups with an elastic band under the bust to ensure a perfect cleavage and low cut legs. BUST: 30"-32" 32-33" 33-35" 35"-37" 37"-39"
WAIST: 25-30" 28-34" 30-34" 32-36" 36"-40"
HIPS: 30-34" 30-36" 34-38" 34-40" 36"-42"